Avati also directed the highly-regarded thriller The House With Windows That Laughed ("La Casa dalle Finestre che Ridono"). While his horror/thriller movies are among the best to come from Italy, Avati has always acted embarrassed about his genre contributions. However, there is little to be embarrassed about in Zeder. It's not a perfect movie. The movie's final developments, in particular, aren't convincing: Stefano decides [SPOILERS COMING] to use a K zone to bring his own wife back to life (a similar development plays a key role in Stephen King's Pet Sematary), but the movie only makes a weak case that Stefano would attempt such an act. His attachment to his wife is so weak that he eagerly abandons her so that he can investigate Paolo Zeder's cryptic essay. And now he's obsessed with bringing her back to life? Nope, there's not much logic there. 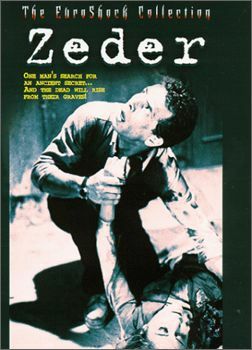 However, while Stefano is searching for an answer and Avati is emphasizing mystery and suspense, Zeder is one of the most unnerving horror movies ever created. This new DVD release from Image Entertainment contains no extras, only the movie itself in an English-language dubbed version. And the video transfer isn't ideal: it was created from a slightly worn and faded print. But it's exciting to be able to see this movie in any form. Zeder is now available on DVD from Image Entertainment. It's part of the "The EuroShock Collection." Suggested list price: $24.99.